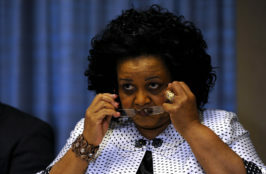 MINISTER Edna Molewa’s public rebuttal of a civil society complaint to the public protector regarding the elaboration of desired reductions in greenhouse gas emissions denies any shortcoming. This simply affirms the need for intervention by a Chapter 9 institution. The minister’s generalities side-step the issue: ongoing failure to elaborate climate-change mitigation objectives for the medium and long term, the pressing need for which is clearly recognised in the policy framework the minister champions. It stipulates that 2030 and 2050 desired emission reduction outcomes be set within two years of its adoption, in 2011. Recourse to the public protector follows many years of concerted effort including civil society participation in all available stakeholder processes and the proactive pursuit of documentation. The latest “consultation” of stakeholders — a briefing by consultants commissioned to work on methodology proposals for a “phase two” to 2025 — confirmed persistent avoidance of big strategic issues or anything beyond incremental change. We’d like to see that.